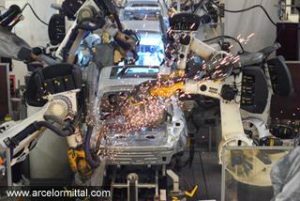 An ever increasing consumer focus on environmental protection, automobile safety and less dependence on oil is prompting automobile manufacturing machine shops to find innovative ways to mass produce vehicles, particularly passenger vehicles. However, consumers aren’t the only ones demanding safer, more productive and environmentally safe vehicles. Global governments are taking a strong stance, requiring new vehicles to meet reduced carbon emissions guidelines. For example, European Union (EU) environmental guidelines mandate that, “By 2015, car makers must achieve an average of 130g CO2/km across their entire new vehicle fleets – this limit will be applied to 65% of the fleet in 2012, to 75% of the fleet in 2013 and to 80% in 2014.” Furthermore, according to the PA Consulting Group, “By 2020 manufacturers face an ambitious target of 95g CO2/km across all new cars sold.” Even with a lengthy notice, it’s anticipated that many manufacturers won’t hit the targets. High strength steels not only reduce a vehicle’s weight, helping manufacturers meet carbon emissions standards, high strength steels also help make vehicles safe. The payoff is huge. For example, the United States Department of Energy says, “Highway vehicles release about 1.6 billion metric tons of greenhouse gases (GHGs) into the atmosphere each year—mostly in the form of carbon dioxide (CO2)—contributing to global climate change.” Additionally, for each gallon of gasoline burned on roadways, 20 pounds of CO2 are released into the environment. Specific vehicle parts advanced steels reduce mass weight on include passenger compartments and vehicle roofs and front and back ends. High-strength or ultra-high strength steel materials will also be used to build engine drive trains and valve controls. To meet aggressive carbon emissions control guidelines, over the next decade, the numbers of smaller cars being shipped from factories for consumer purchase may also increase. Whether automobile manufacturer machine shops limit sales to local jurisdictions or make their vehicles available to international drivers, they must invest in new technologies that will help them remain competitive in a changing market. Some of these added, aggressive changes include policies that reduce overall gas and oil consumption, saving drivers money at the gas station. The steel industry is a formidable partner in these developments, continuing to develop third generation advanced high-strength steels.